People are the most important part of the Pacific Islands. The welfare of the people is a defining value that guides all of the work of the Pacific Regional Environment Programme (SPREP). SPREP is a regional organisation established by the governments and administrations of the Pacific region to look after its environment. It has grown from a small programme attached to the South Pacific Commission (SPC) in the 1980s into the Pacific region’s major intergovernmental organisation charged with protecting and managing the environment and natural resources. It is based in Apia, Samoa, with over 70 staff. Secretariat of the Pacific Community The Secretariat of the Pacific Community (SPC) is a regional technical and development organisation. SPC work programmes develop the technical, professional, scientific, research, planning and management capability of Pacific island people. The agency has three main divisions: land, marine and social. SPC’s headquarters are located in Noumea with a sub-branch in Suva. Pacific Islands Forum Secretariat – As the administrative arm of the Pacific Islands Forum, the Pacific Islands Forum Secretariat (FORSEC) undertakes programmes and activities that support, or implement, decisions made by the Forum Leaders. The Forum Secretariat is also the base of CROP. The Secretariat is based in Suva, Fiji. South Pacific Regional Environmental Programme – The South Pacific Regional Environment Programme’s (SPREP) charter is to strengthen the capacity of Pacific island members to plan and manage their own national environmental programmes and to enchance regional cooperation to deal more effectively with issues that are transboundry in nature or which require interventions at the global level. The work of the organisation covers nature conservation, pollution pervention, climate change and economic development. South Pacific Applied Geoscience Commission – The South Pacific Applied Geoscience Commission (SOPAC) work focuses on providing assistance to its 20 member countries in three key programme areas: Ocean and Islands Programme, Community Lifelines Programme and Community Risk Programme. Pacific Islands Development Programme – The role of the Pacific Islands Development Programme (PIDP) is to provide professional services and research information to Pacific Island governments. The organisation is based at the East-West centre in Hawaii is involved in the following five major activity areas: Secretariat of the Pacific Islands Conference of Leaders, United States/Pacific Island Nations Joint Commercial Commission Secretariat, research, education and training. South Pacific Tourism Organisation – The South Pacific Tourism Organisation (SPTO) is the mandated to promote the Pacific Islands as a tourist destination. The SPTO’s objectives, through tourism are: strengthening regional cooperation; contributing to sustainable development; promoting global awareness of the region; enchancing the resources of the region; and promoting the cultural diversity of the region. University of the South Pacific – The University of the South Pacific (USP) provides tertiary education to the Pacific region. USP has 12 Member Countries and three campuses: Laucala Campus located in Suva, Fiji; Alafua Campus located in Apia, Samoa; and Emalus Campus located in Port Vila, Vanuatu. USP Centres are located in each Member Country. 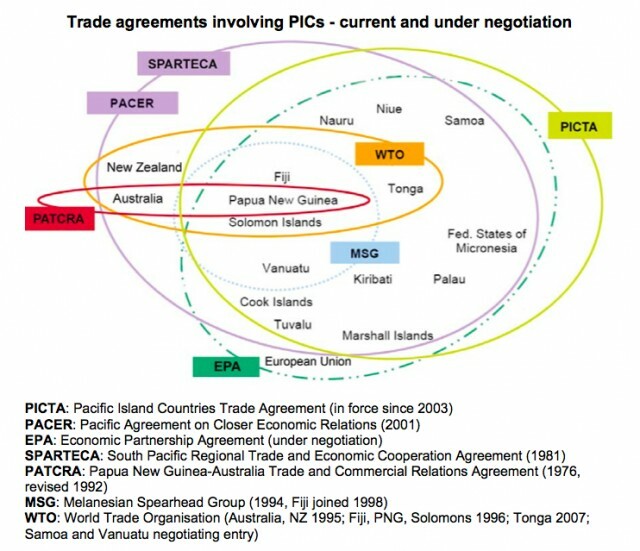 Pacific Islands Countries Trade Agreements – Graph courtesy of Oxfam NZ. Done at Apia, 16 June 1993, Entered into force 31 August 1995. The Governments of Australia, the Cook Islands, Fiji, Kiribati, Nauru, New Zealand, Niue, Papua New Guinea, Solomon Islands, Tonga, Tuvalu and Western Samoa, being members of the South Pacific Forum. The Government of the Independent State of Papua New Guinea, the Government of the Solomon Islands and the Government of the Republic of Vanuatu. A Science Working Group (SWG) was formed at the first international meeting on the establishment of the South Pacific Regional Fisheries Management Organisation (RFMO). The Science Working Group (SWG) is one of two technical working groups established to support the development of the South Pacific regional fisheries management organisation. The other is the Data and Information Working Group (D&IWG). The purpose of the science working group is to co-ordinate the compilation of science information to support the establishment of a South Pacific RFMO. The SWG evaluates benthic impact assessments prepared by Participants in respect of proposed bottomfishing operations in the SPRFMO Area. The SWG conducts intersessional work on the basis of work prgrammes agreed by the international meetings. The intersessional work of the SWG is conducted via email and this website. The current workplan is included in the Report of the most recent meeting. The SWG is chaired by Andrew Penney (New Zealand). Participation in the science working group is open to scientists from states, entities, regional economic integrated organisations and observers participating in the international meetings on the establishment of the South Pacific RFMO. Journal Of Pacific Rim Psychology – Consensus is an essential ingredient for conflict resolution, reconciliation, agreement, and peace in Melanesian societies. The psychological aspects of its positive influence in establishing a common ground between conflicting parties have not been explored. From a psycho-cultural perspective, I focus on the positive dynamism of consensus. I provide the Bougainville crisis within Papua New Guinea as a case vignette to illustrate the utility and significance of consensus in the search for concrete principles to unite a ‘disoriented’ world. In doing so, the issue of incorporating indigenous psychological knowledge into mainstream psychology becomes clearer. The article searches for psychological principles germane to reducing conflict and maintaining peace. This kind of utility is exemplified in a case study of achieving consensus in Papua New Guinea. Summary information on the Role of International Fishery and other bodies – After the peak total catches of over 26 million t observed in the late 1980s, total landings in Area 61 declined from 25.7 million t in 1990 to 24.8 million t in 1993. The main fisheries in Area 61 are: salmon, flatfishes, cods, Alaska pollock, croakers, seabreams, Pacific sandlance, Atka mackerel, filefishes, Pacific saury, Japanese jack mackerel, scads, amberjacks, pomfrets, herrings, Japanese pilchard, anchovies, tuna and tuna-like species, hairtails, chub mackerel, sharks and rays, crabs, prawns, shrimps, oysters, mussels, scallops, cockles, Japanese carpet shell, clams and cephalopods. Landings of bony fishes not included above was 5,362,532 t in 1993. L’initiative pour la protection et la gestion des récifs coralliens dans le Pacifique, engagée par la France et ouverte à toutes les contributions, a pour but de développer pour l’avenir une vision de ces milieux uniques et des peuples qui en dépendent ; elle se propose de mettre en place des stratégies et des projets visant à préserver leur biodiversité et à développer les services économiques et environnementaux qu’ils rendent, tant au niveau local que global. Elle est conçue en outre comme un vecteur d’intégration régionale entre états développés et pays en voie de développement du Pacifique. Regionalism presents opportunities for Pacific Island countries to overcome problems related to smallness and remoteness. It also creates a bigger cooperative region in which Pacific peoples will have more opportunities for activities not viable at the national level. The Pacific Plan the most ambitious regional innovation for far provides the most comprehensive and integrated regional framework for all stakeholders and partners to support through regionalism national efforts at improving good governance and economic opportunities. This report was prepared for the Pacific Islands Forum Secretariat (PIFS) in Suva, Fiji Islands. The report is one output of an Asian Development Bank (ADB) technical assistance project.